Heat your oven to 190 Celsius. Sift dry ingredients into separate bowl. Melt butter in a small pot on a medium heat and add vinegar and milk, then add to the sifted ingredients to the milk mixture and give it a good mix. Now mix in the eggs mix one at a time until you you have well combined mixture. Pour into ovenproof casserole dish that takes about 2 liters. Bake at 190 celsius for 45 mins until the top is nicely browned and your kitchen smells fantastic. Melt all the sauce ingredients together in a small pot over a medium heat and pour over the pudding before serving, preferably while its still hot. Serve it with whipped cream or custard or both. Enjoy! I do enjoy your recipes,, thanks. 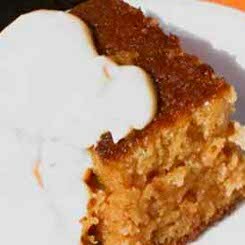 How long in advance can I make Malva pudding for a functions? And is doubling up ingredients successful or should I make one batch at a time? It’s for around 50 people!! The 4th para in the process doesn’t read right? You talk about eggs one at a time, yet eggs are already beaten? looking forward 2 trying it out, this i so love, will let you know how it turned out, i can almost taste it in my mouth, yuuuummmmmmmy.